For ubiquitin signaling pathway, selective autophagy, proteasomal degradation and protein aggregation studies using fluorescence microscopy. Specificity: Recognizes ubiquitin-protein conjugates and free ubiquitin. Formulation: Liquid. In PBS containing 0.01% sodium azide as preservative. Technical Info/Product Notes: Ubiquitin polyclonal antibody BML-UG9510 was conjugated to fluorescein by a proprietary method. The resulting fluorescein-labelled ubiquitin polyclonal antibody (BML-PW1235) facilitates ready detection of ubiquitinylated protein conjugates in cells by fluorescence microscopy. 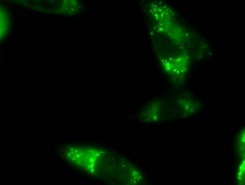 Detection of ubiquitinylated protein conjugates in HeLa cells by fluorescence microscopy using fluorescein labeled ubiquitin pAb (BML-PW1235), at 1:250 dilution. HeLa cells were treated with proteasome inhibitor MG-132 (5µM, BML-PI102) for 12 hours prior to analysis.